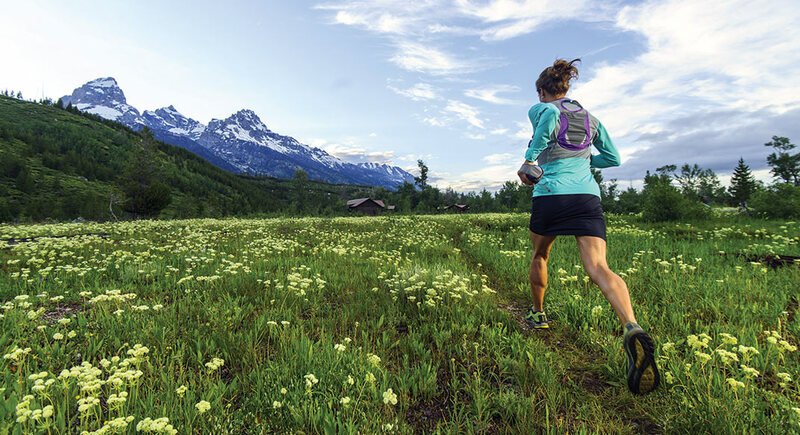 A trail runner's guide to Jackson, Wyoming, in the shadow of the Tetons. 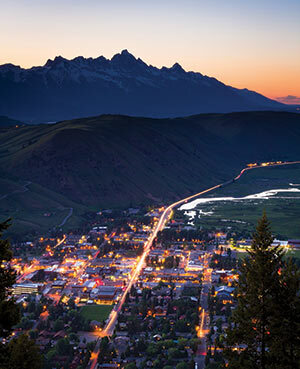 As glam as Jackson, Wyoming, tries to be with its high-end shops and hotels in town and behemoth Jackson Hole Ski Resort nearby, these trappings of civilization are blips on the radar of a massive and wild landscape. 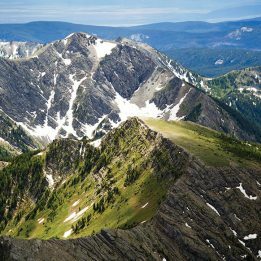 Stepping out of Jackson, you immediately enter the Greater Yellowstone Ecosystem, a large and almost-intact ecosystem that encompasses nearby Grand Teton National Park and thousands more square miles of wild country. We’re talking thousands of miles of trails and views that end only when the earth curves away. We’re talking remote places where you’ll go days without seeing another human. We’re talking open spaces filled with charismatic megafauna and big predators. We mean “wild” in every sense of the word. Therefore, the trail running around Jackson should be approached with caution. Much of it is intermediate to advanced level, entailing remote terrain where mountain skills and wildlife savvy are essential. Snow King Mountain / Looming over Jackson Hole proper, this is the mountain on which Snow King Ski Resort operates in the winter. In the summer, you can run the 1.8-mile trail that climbs about 1,500 feet up the face. Return the way you came, join up with one of the more leisurely trails that make their way back down on the mountain’s shoulders or take the ski lift when it’s open in summer. Cache Creek Trail / A popular, meandering trail accessible from downtown, this trail enters the Gros Ventre Wilderness, part of the Bridger-Teton National Forest, and allows you to access a big network of backcountry trails. At about mile 11 comes the alpine stunner Turquoise Lake. You can turn around anytime you wish for an out-and-back up to a long run. Teton Crest Trail / At 39 miles end-to-end, this iconic route traverses the high country of Grand Teton National Park. 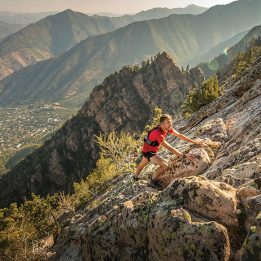 It can be run in a single push by experienced trail runners, but it’s a graduate-level outing because of its distance, technicality, navigation requirements, altitude, weather and wildlife. That said, the work pays off with views of the equally iconic Grand Teton—the largest peak in the national park and a classic mountaineering destination—and other tall peaks. Jackson Town Square to the summit of Snow King Mountain, this is a community tradition stretching back 48 years. 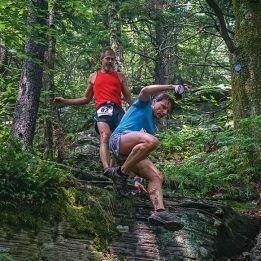 Rendezvous Mountain Hill Climb / Oof! This race has some brutal stats: 6.1 miles and 4,100 feet of climb up the face of the Jackson Hole Ski Resort. It takes place on the first Saturday in August and is all singletrack after a brief gravel-road approach. There’s some sporty, hands-on-rock scrambling near the top, which adds to the adventure. Get There / Being a high-end tourist destination, Jackson has its own airport served by multiple major airlines and offering plenty of car rentals. Navigate to trailheads around downtown and Jackson Hole Ski Resort with the local public-transit system, Southern Teton Area Rapid Transit. You’ll need a car to get out to Grand Teton National Park and other points afield. Play Tourist / Take the aerial tram to the top of the Jackson Hole Ski Resort for a view from the top of the world. Better yet, use the tram for a one-way voyage to open up access to the trails higher up the mountain. Explore Grand Teton National Park. Take Note / Grizzly bears, elk, moose, bison and other animals range around Jackson. Educate yourself especially on proper trail safety in grizzly-bear country, which includes carrying bear spray, yelling to make noise and running in groups. This article originally appeared in our September 2016 issue.